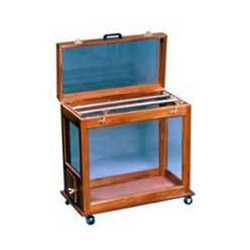 We are engaged in manufacturing and exporting Rescholar's Chromatography Cabinets, which are made of teak wood with glass on all four sides and on top. The internal surface is coated with wax in order to ensure resistance to solvent and other chemicals. We offer these cabinets at industry leading prices to our customers. - Material: made of teakwood with glass on four sides and on top. - Internal surface wax coated of solvent resistance. - Hinged top provided with rubber gasket for air tight closing. - Window with air tight door in lower portion. 16.1132/1134 Paper Chromatography Cabinet “LABOGLASS Ascending or Descending, made of teak wood and glass construction. It can accomodate two (troughs) and six glass rods. Labo Glass Scientific Supply Co.
Made of teakwood with glass on all four sides and on top. Internal surface wax coated for solvent resistance. Hinged top provided with rubber gasket for air tight closing. Window Heavy castors provided for easy movement. Finished in lacquer polish. Supplied with two stainless steel troughs and 4/6 glass rods. For viewing and detecting prepared substances on T.L.C. layers fitted long wave (365nm.) U.V. tube for use on 220volts.AC. We are instrumental in offering Laboratory U.V Chromatrography Inspection Cabinet to our clients. For viewing and detecting prepared substances on T.L.C. layers fitted with long U.V. Tubes of different wave lengths, without filter, for use on 200V AC. Separate lamp for visible light. 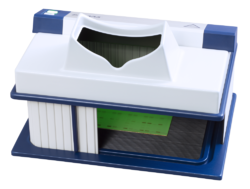 We are passionately engaged in providing a wide assortment of Chromatography Chamber. For viewing and detecting prepared substances on T.L.C. layers fitted with long U.V. Tubes of different wave lengths, without filter, for use on 200V AC. Separate lamp for visible light. For viewing and detecting prepared substances on T.L.C. layers fitted with long wave (365) nm.) U.V. tube for use on 220 volts. AC. Our company has achieved widespread recognition in providing UV Chromatography Inspection Cabinet.